Anyone in the Atlanta area should check out VCFSE 7.0! It is being held April 27-28, 2019, At the new Computer Museum of America, 5000 Commerce Parkway, Roswell, GA 30076. This year's theme is "Unix". Douglas McIlroy, one of the original developers of UNIX at AT&T Labs in 1969, is set to be the keynote speaker for the event on Saturday, April 27, 2019, from 11am to 12noon. This year the museum portion is almost completed. The official opening will be a few more months, but things should be looking really nice. Huh, cool. 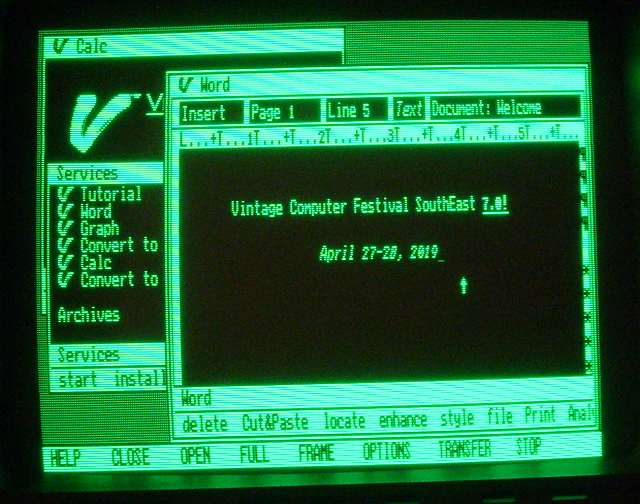 But what made you decide to make an announcement about the Vintage Computer Federation and their festivals here on WinBoards? Because vintage hardware and vintage software go hand in hand. Plus, I plan to be there. Say, SomeGuy what were you using to create that picture of Visi Word? Is that an actual piece of old hardware? Yes, that is a Compaq Portable Plus running Visi On.